The article deals with the question of expanding the boundaries of grammar in order to include into it discourse analysis, which, in turn, is impossible without expanding the semantic base of the described language units and their semantic transformations in different types of discourses. The author states that the idea of developing “Russian Grammar of Meanings” was expressed by N. Yu. 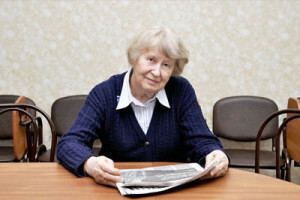 Shvedova immediately after the completion of the 1980 Russian Academic Grammar. The author provides information on modern approaches to this problem, associated with the representation of the general structure of the narrative (in its broad discursive sense), and the allocation of invariant structural components, characteristic for all possible narratives. Cases of proximity of values of separately taken syntactic constructions and their real belonging to different types of discourses are demonstrated in order to confirm the need of including into grammatical semantics not only the meanings of linguistic units, but also the general properties of their discursive functioning. Keywords: discourse analysis; the structure of the narrative; the components of narrative; the importance of the linguistic units in the system and the types of semantic transformations in the discourse. The article deals with the problem of some nouns, the meanings of which are difficult to classify as animate or inanimate by the choice of case forms. Observation of large linguistic material allows to identify 10 problematic groups of nouns and to discern the dominant trends in the classification of nouns included to one or another of these groups. Keywords: category of animate / inanimate; masculine nouns and pronouns in the accusative case singular; plural nouns; group problem areas; semantics and linguistic tradition. The article dwells upon online lecture as an independent genre of Internet discourse. The author offers a classification of online lectures as a genre, reflecting the transition from the classical form of material presentation to a new way of providing scientific understanding of the world. Keywords: Internet discourse; genre; lecture; online lecture. The article provides complex description of the “letter of happiness” genre from the perspective of communicative-semiotic structure and linguoecological potential. The authors derive and characterize substantial and non-substantial facients (components of a situation), defining system-forming features, and providing ratio of informative and emotive components in the text content. Ecological factor of the content of “letters of happiness” is also taken into account. Necessity of preventive educational work through teaching and art communication for the recovery of modern society is underlined. Keywords: “letter of happiness”; emotivity; facient (component of a situation); linguoecology; destructiveness. The article deals with the mythological vocabulary used as a means of speech aggression. Dwelling on the example of mytholexeme “kikimora”, the authors pinpoint that the similar words are more likely to be used in Internet discourse as invective rather than nominative means. Moreover, the analysis of Internet discourse shows that the changes in the semantic structure of the “kikimora” lexeme is undergoing, and they are of great importance for the characteristics of the lexical system of modern Russian. Keywords: mytholexeme “kikimora”; the nominative function; the function of invective; Internet discourse; verbal aggression; the mythological image; lexical meaning; semantic structure of the word. The purpose of the article is to present a cognitive model of the image of the Kemerovo Region, based on the results of monitoring data analysis of regional, Russian and international media, including such information independent modules as economic, social, sports, cultural, historical, tourist, scientific, educational, political, and valeo-ecological subimages. Keywords: media; region; image of the region; subimage; cognitive model of image. The author poses the questions, allowing to distinguish the notion of topos from adjacent phenomena, and demonstrates its relation to the idea of speech genre. Keywords: definition of topos; phenomenology; speech genre; rhetoric. The article explores some particular qualities of the literary criticism at the turn of the 20th century, analyzing communicative and pragmatic factors of text formation, which can illustrate the general tendency of the use of “common places” as micro fragments, actualizing the structural and semantic significance and emotionally expressive aspects of the content. The “common places” as special stylistic devices for texts’ organization of the literary-critical thought of this period were serving for the formation of a receptive setting, which allowed authors of the works to control the process of reading perception. Keywords: “common place”»; integration; pragmatics; expression; compositional structuring. The article explores the 11th century work of Russian literature, which can be regarded as a model of public speaking art. Special attention is paid to Metropolitan Hilarion’s ideas about the meaning of individual life as well as of the whole nation’s life. These ideas are associated with the Christian understanding of the meaning of Christ’s atoning self-sacrifice for the salvation of mankind from eternal death. The analysis is provided in the context of this text’s genetic relationships with Orthodoxy within its dogmatic and exegetical framework. Keywords: religious and philosophical idea; Russian people; word; life; death. The author argues that the fate of the national way of life of the pre-Petrine period in the post-Petrine space has found Pushkin’s special artistic interpretation. The article shows the proximity of Pushkin’s model of the world to the Ancient Russian type of consciousness. In his work, the poet captured the possible options for the development of the national way of life, and the two vectors of it in the Imperial space of the first third of the 19th century, which is associated with the artistic images of sanctity of the ordinary life and with their opposite dead forms of human life. Keywords: national way of life; routine; sacredness; ritual; tradition. The author, drawing on the material of Demyan Bedny’s archive, reveals some paradoxical details of the biography and work of the famous Soviet proletarian poet. A friend of Lenin, Bedny was close to the top of the Soviet government, being at the same time a close friend and interlocutor of Shalyapin, Tarkhanov, Moskvin, and other outstanding cultural figures. Enthusiastic words about his poetic talent were left by Pasternak, Mayakovsky, Pavel Vasilyev. The relations of “friendship enmity” connected Bedny with Meyerhold and Tairov. The poet’s relationships with Stalin also remain wrapped in mystery. Keywords: Demyan Bedny; Soviet culture; Soviet theater; Stalin. The author argues that in Dovlatov’s prose many dialogues are devoid of different world views, and the function of such dialogues is twofold: in the depicted world the leading interlocutor is trying to stop the conversation, but due to the game with the reader’s expectations, these dialogues are establishing the communication of the text with the reader. Keywords: Sergei Dovlatov; polyphony; dialogue; game with the reader; narratology. The article discusses the problems of lexicology and cognitive syntax in modern cognitive science. The need to integrate knowledge about the world, knowledge of the language, and knowledge of the specific speech situation is a prerequisite for learning verbal and semantic language code of a foreign language, mastering its conceptual picture of the world. Keywords: cognitive lexicology; syntax; cognitive language education. The article represents the experience of the International contest of open courses in the Russian language, which was aimed at identifying the most effective and competitive electronic resources for students of all levels. The authors describe the stages of the Contest, the specifics of courses’ examinations, the criteria for remote resources evaluating. Keywords: open education; МООС; contest; criteria; expert evaluation. The article presents the mass open on-line courses in Russian as a foreign language for the levels B1, B2, C1, included as the basic component in the interactive learning complex. These МООСs are innovative, they have implemented the latest achievements of modern linguistics, linguodidactics and methods of teaching foreign languages. Keywords: massive open on-line courses; Russian as a foreign language; basic course; linguistic and didactic features. The article discusses the approaches to language MOOCs creation, and analyzes the linguistic tradition of such courses in connection with a particular course. The main message comes from the concepts of digital learning: digital format should encourage students to leave the passive recipient position, and to become involved independent learners. Keywords: digital learning; language courses; MOOC; active learning. The article is devoted to the consideration of linguistic methods of developing mass open online courses of Russian language for indigenous small peoples of Russia within the framework of the Federal Targeted Program “Russian Language”. The courses are aiming at popularizing the Russian language, increasing the efficiency and accessibility of its study, and improving the quality of education in Russian on the Internet. Keywords: linguistic bases; electronic educational resources; indigenous small people. The article deals with lexical representation of common situations for everyday communication. A corpus of learner dialogues as well as “Russian Learner Corpus” became the basis for such lexical component analysis. The issue addressed in the paper is to what extent the lexis of common situations corresponds to the existing standards for Russian as a Foreign Language at B1 level. Keywords: learner dialogues; lexical representation; everyday communication; construction. Ganapol’skaia, E. V. Frazeologicheskii slovar’ sovremennogo rossiiskogo detektiva [Phrase-Book of Contemporary Russian Detective Story], in 2 vols. St. Petersburg: Zlatoust, 2015-2016. Tarlanov, Z. K. Russkii literaturnyi iazyk pushkinskogo perioda: stanovlenie kritiko-publitsisticheskogo stilia [Russian Literary Language of Pushkin Period: Development of Critical and Social-Political Style]. Petrozavodsk: Petrozavodsk UP, 2017. 275 p.
2nd International Symposium “Russian Language in Polycultural World” (Yalta, June 8-12, 2018). 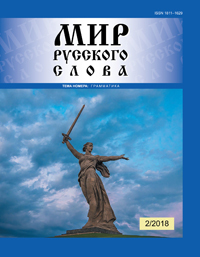 The article focuses attention on the linguistic and cultural potential of educational (inauthentic) and authentic texts about the Great Patriotic War, and the ambiguity of their perception by foreign students studying Russian in Russia. The author offers possible methods and forms of working with such texts, and highlights the need to take into account the peculiarities of the personal and nation-specific attitude of students to the texts on this subject in the practice of RFL teaching. Keywords: authentic text; educational text (inauthentic text); Great Patriotic War; Russian as a foreign language; foreign students.